Judge Celina Vasquez is proud and most appreciative of the opportunity to serve the people of Brazos County as Justice of the Peace, Precinct 4. She is committed to a non-compromising, constitutional application of fairness and equality in all matters presented for her judicial consideration. 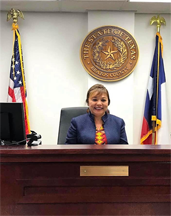 Daughter of Mexican immigrants with generational roots in Texas and California, Judge Vasquez earned a Bachelor of Arts in Latino Studies, a Master of Arts in Government and a Master of Business Administration from Texas Women’s University. Prior to being elected Justice of the Peace, Judge Vasquez taught government at Blinn Junior College and has retained membership in the Texas Community College Teachers Association. A trained educator, she served as the Community Advisor for the Texas A&M Collegiate LULAC Council. Reflective of a dedicated commitment to public service, Judge Vasquez is a member of the Hispanic Forum of Bryan/College Station and the Mexican-American/Latino Museum of the Brazos Valley. She also serves on the Board of Directors of the Brazos Valley African American Museum, Bryan ISD Foundation Board Friends of the Bryan/College Station Library, and the Brazos Interfaith Immigration Board. She also served on the PRIDE Community Center Board. Additionally, she is a graduate of Leadership America, Leadership Texas, the Bryan Police Department Citizen’s Police Academy, and the Brazos County District Attorney’s Citizen Academy. Judge Vasquez’s history as community advocate also includes assisting in community development council activities, child protective services outreach efforts and the promotion of numerous community improvement initiatives. With her family providing a constant source of support and encouragement, Judge Vasquez is literally a “soccer mom,” serving as a Parent Volunteer for the Bryan Soccer Club and the Bryan National Little League at Bond Park and as Vice-President of the Sam Rayburn Intermediate School PTO in Bryan. They are members of Santa Teresa Catholic Church. Her favorite pastimes are reading in Spanish to her son, Diego, and spending quality time with her husband, Fernando, who serves as Director of Medical School Admissions at Texas A&M Health Science Center. Notice: Do not attempt to contact a judge by mail, email, or in person about any pending or potential lawsuit. Doing so may result in serious consequences.